The People's Millions is returning to ITV regional news. Across the country we're giving away 76 prizes of up to £50,000. 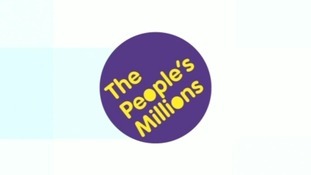 The People's Millions is coming back to ITV regional news, and there's grants of up to £50,000 to give away to winning projects which improve the lives of the community where you live. If you want to be part of it - here's how.. There is still time to enter the People's Millions awards to have your chance to win up to £50,000. The deadline is midday on Monday, May 13. Here are the details of how your organisation can enter. Visit www.itv.com/peoplesmillions OR call 0845 0 10 11 12. Each call costs up to a maximum of 3p per minute PLUS an additional 14p set-up fee from a BT residential landline. Calls made after the closing time will not be counted but may still be charged . There is still time to enter the People's Millions awards. Prizes of up to £50,000 each will be awarded to the winning projects. Tthere are just a few more days left to enter The People's Millions. Prizes of up to £50,000 each will be awarded to the winning projects. Helen Ford has been finding out how the People's Millions grants have helped improve lives. She revisited Lynn McManus - a winner from last year - to find out about her story. Calls from other networks may be higher and from mobiles will be considerably more. Calls made after the closing time will not be counted but may still be charged. People's Millions: Are you eligible? The People's Millions is coming back to ITV regional news. Across the country we are giving away 76 prizes of up to £50,000 each to the winning projects - including across the North East. Over the past eight years ITV - in partnership with the Big Lottery Fund - has awarded nearly 28 million pounds to 523 community projects across the UK.